There were only two gardens that I wanted to visit when we went to Morocco, Jardin Marjorelle and the gardens of the hotel La Mamounia, both in Marrakesh. I’ll do a separate post about them in the near future but in the meantime I’d like to share some observations about some of the plants and gardens we saw along the way. 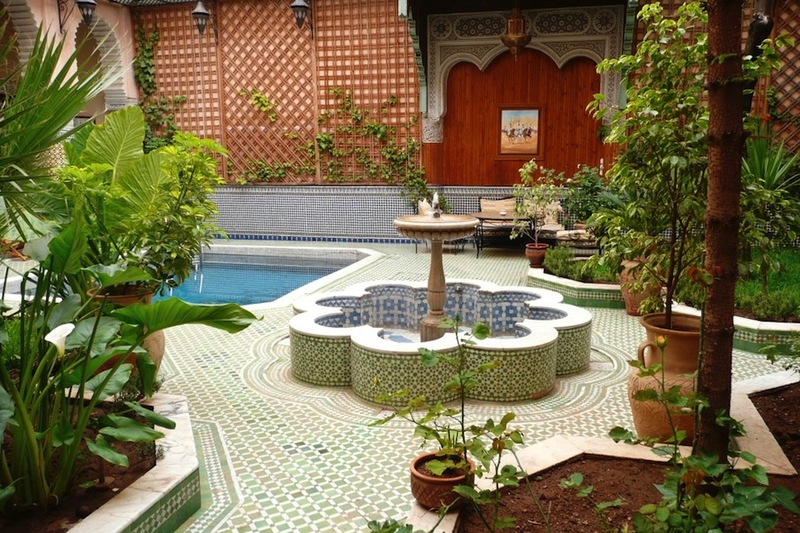 The courtyard at the Riad Jaouhara included a fountain and a pool. When we booked the tour we opted to stay mostly in riads, the traditional Moroccan homes with internal courtyards. They turned out to be a real treat. Most were located in or near the oldest parts of the cities, known as medinas, which were virtually without any greenery so the courtyards provided respite from the hot and dusty streets outside. Breakfasts (and sometimes delicious home cooked dinners) were served in their delightful gardens. The courtyards usually contained garden beds, a fountain, seating and dining areas and sometimes even a swimming pool. 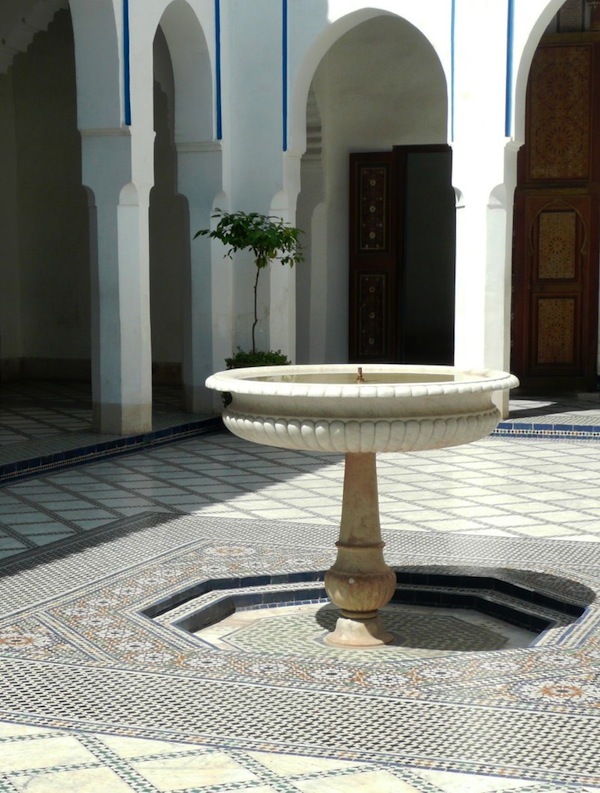 However, not all of the courtyards had a garden and the sumptuous Riad Kniza (which is more of a hotel that a home) had a very elegant courtyard that featured a central fountain filled with rose petals but no plants. 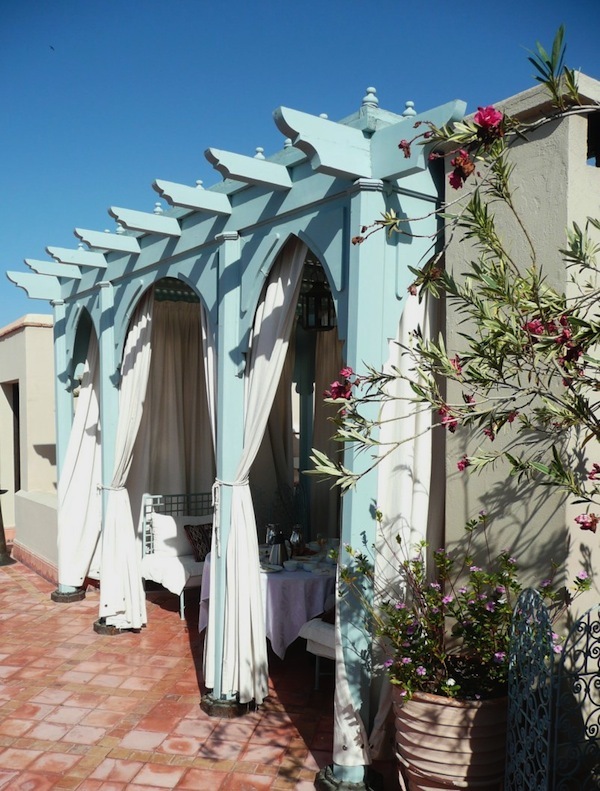 It had a rooftop garden instead where you could relax or dine in romantic curtained pavilions. I like the fact that the pavilions weren’t overly ornate but still conveyed a sense of the exotic. Fountains were a constant theme. 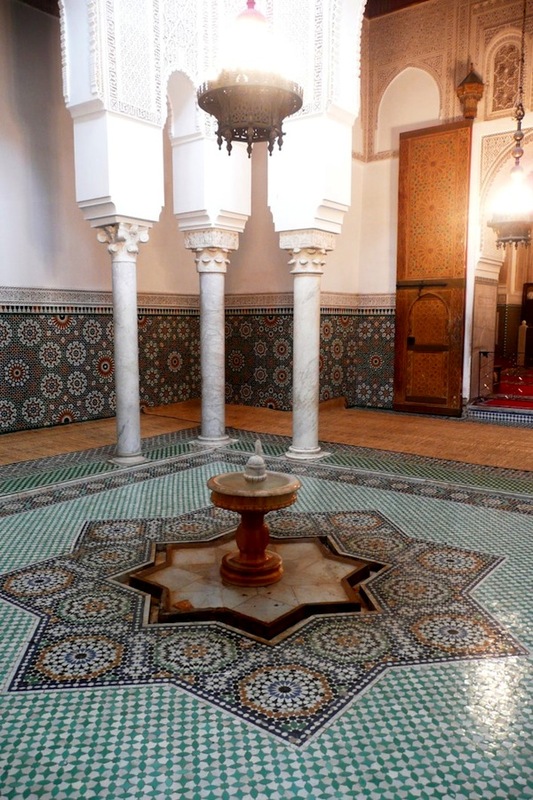 Pedestal fountains were found in the richly decorated courtyards of mosques, universities or palaces but somehow they retained a beautiful simplicity. The carved bowls often balanced on surprisingly slender pedestals making them so much more refined than the fountains of other Mediterranean countries I’ve visited. The traditional pedestal fountains appealed to me more than the wall fountains which are being made today. In contrast to the pedestal fountains the wall fountains are decorated with brightly coloured mosaics and are mounted onto plain walls. 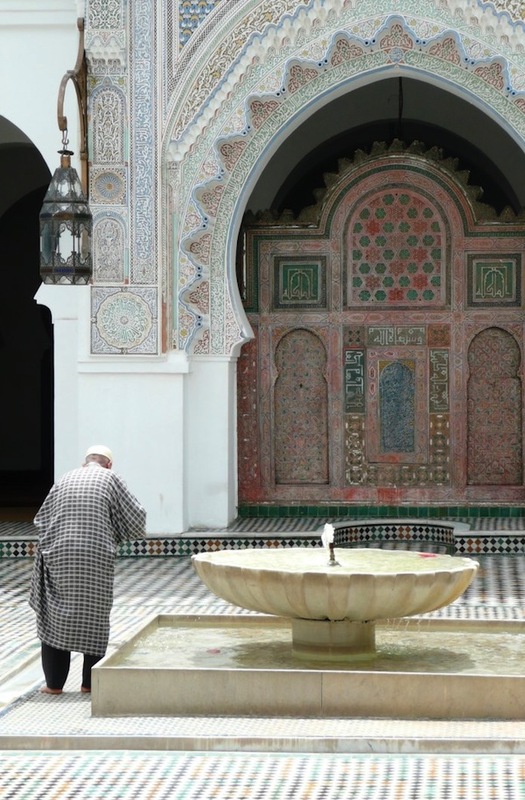 In addition to being focal points for the courtyards many fountains also have a dual purpose as they are used for ritual ablutions performed before prayers. Inland from the coast olives, date palms and conifers were very common, often growing in groves and plantations. We also saw groves of Argania spinosa growing in very arid conditions in the south west of the country. Argan oil, which is used in cosmetics and for cooking, is extracted from the kernels of their fruit. 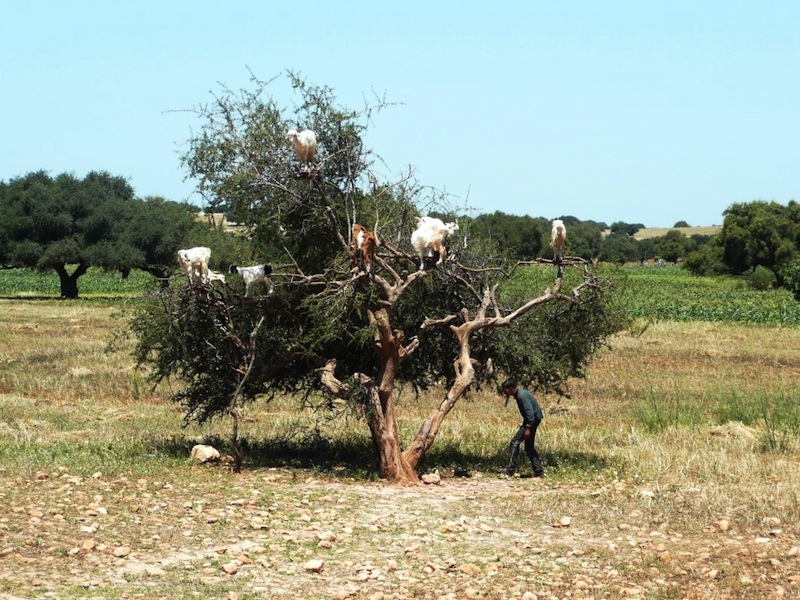 A tourist industry has sprung up by the roadside where visitors are amused by the sight of goats climbing all over the trees in pursuit of one of their favourite foods. One wonders whether Argan trees could be successfully cultivated in the arid regions of Australia. 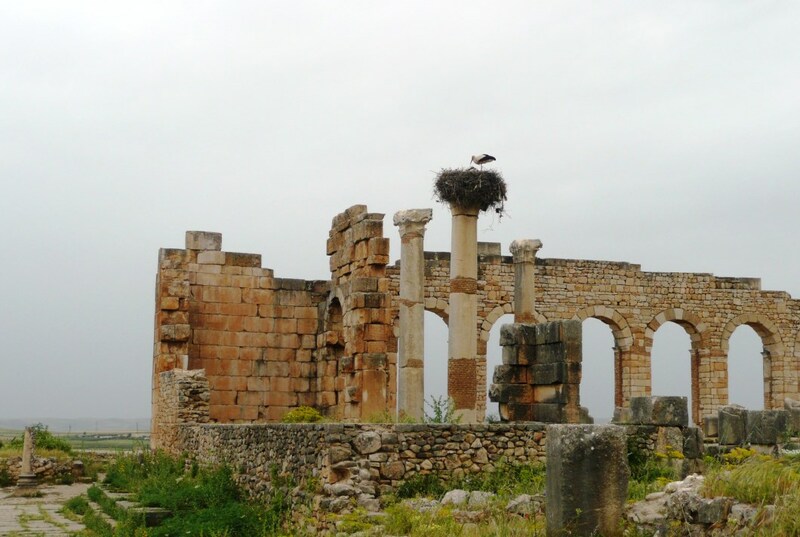 It wasn’t the sight of the ancient Roman and Moorish ruins at Chellah that initially grabbed our attention; it was the sight and sound of thousands of nesting storks perched on top of the ruins and in the trees on the hillside above. They had even colonised some denuded trees along the river bank, building multiple nests on the one trunk. Eventually our fascination with the storks waned and we explored the ruins and noticed that there was a garden at the bottom of the hill. As we descended into the valley the cool, damp air of the garden enveloped us. The linear garden had a central path which was shaded at one end but sunny at the other and as we emerged back into the sunshine we were dazzled by two stunning pomegranates with vibrant flowers. 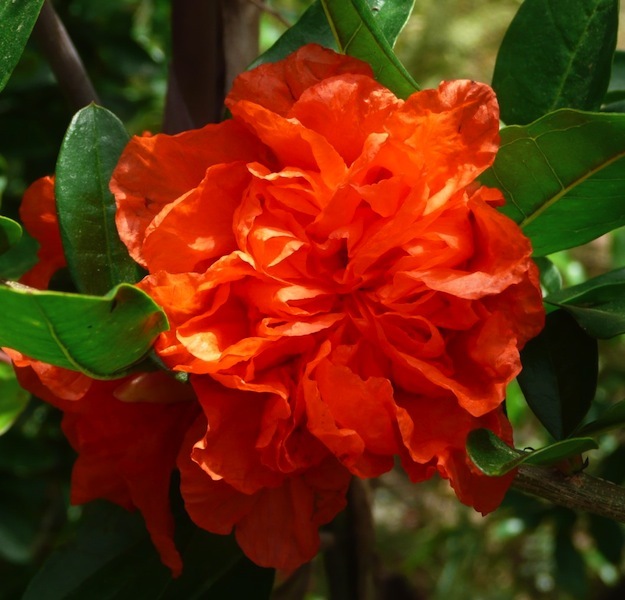 One bush had gorgeous apricot coloured petals edged with cream while the other had bright orange flowers and both bushes had glossy and luxuriant foliage. I’ve always loved pomegranates (Punica granatum) for the attractive fruit they produce but unfortunately the bushes themselves tend to look a bit straggly at home. These double flowered cultivars don’t produce the large edible fruits that the single flowered species does but I guess you can’t have everything. The ruined Roman town of Volubilis is well known for the fantastic mosaics that have been unearthed there and they were truly impressive but it was the abundance of flowering plants that made the site memorable to me. This was the first time that I can remember wanting to photograph an example of every species in bloom that I could find. 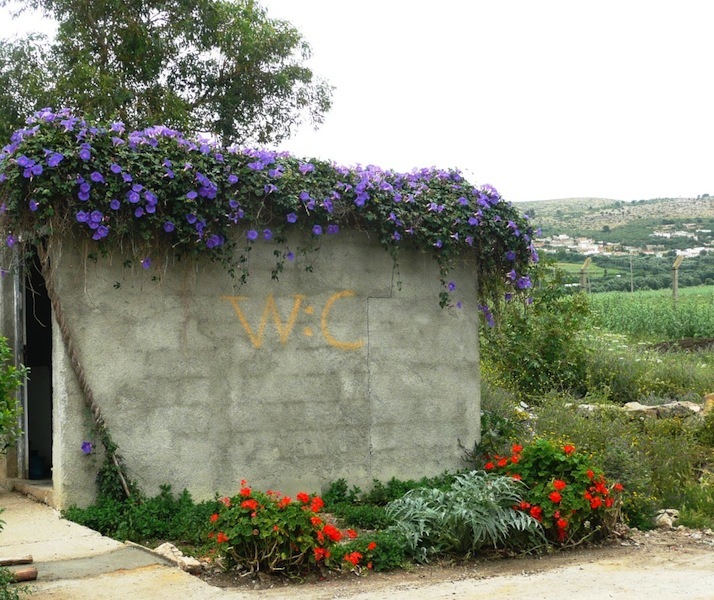 I managed to photograph about 30 different flowers (not counting the ones around the WC which had obviously been planted) and you can see most of them on the two pages from my digital album. 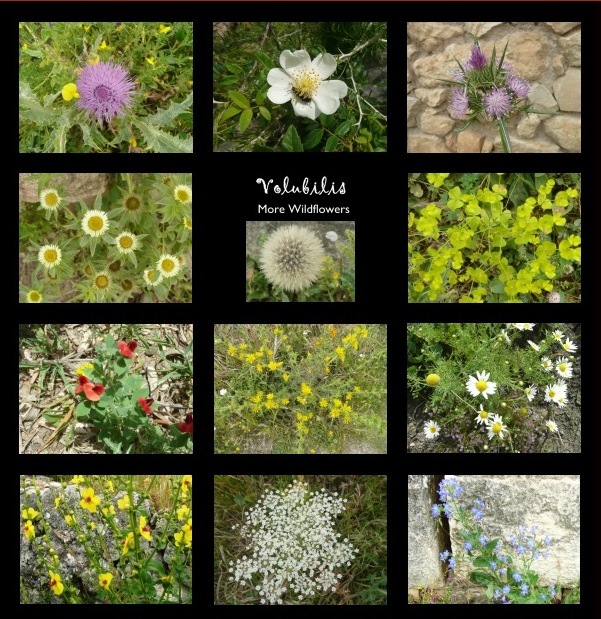 While some of the plants at Volubilis may be endemic, it is intriguing to think that others may have been introduced to the area by the Phoenicians and Carthaginians in the 3rd century BC or by the Romans when they build the town in the 1st century AD. 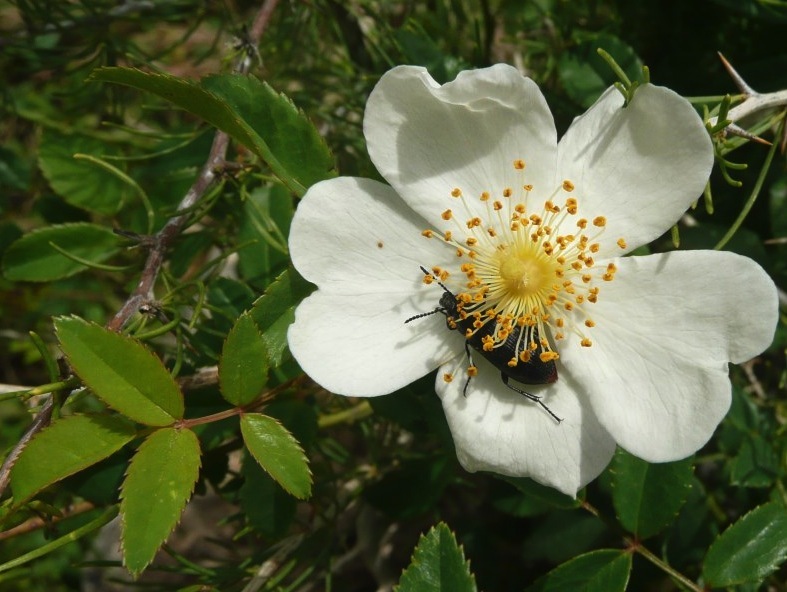 Some of these plants are grown in Australia as garden plants while others are thought of as weeds. For example the echium looked suspiciously like Echium plantagineum known as the weed Salvation Jane or Patterson’s Curse to Western Australians. Carpeting thymes, daisies, thistles, clovers, forget me nots, echiums, euphorbias, bind weeds, poppies, borage, the odd rose and many flowers that I didn’t recognise all came together to create an enchanting garden enhanced by the ancient stone walls, mellowed by time. A few storks had taken up residence in the ruins, overlooking the fertile plains with their patchwork of pastures and olive groves. 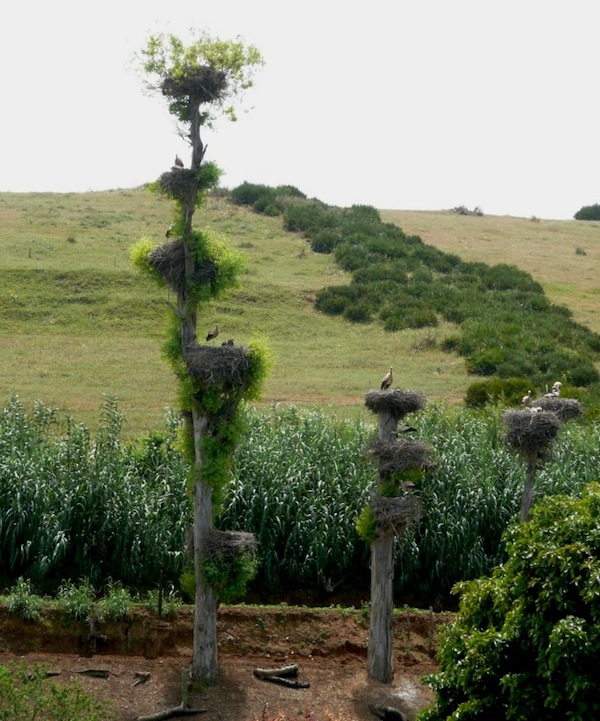 Storks really do seem to have a knack for nesting in places of extraordinary beauty. We visited Morocco in mid- May and travelled with Experience It! Tours on an 11 day 10 night tour. We changed the itinerary so that we didn’t go to the desert but had a few extra days in the places that interested us. I visited Morocco about 10 years ago and found it a fascinating place. Those cool, tranquil inner courtyards are such a contrast to the mayhem outside. I would look at the greenery just creeping over some of the high walls and long to see what was on the other side! I don’t think much would have changed in the last 10 years, Catherine, except perhaps the medinas and souks may be even more noisy due to the increased numbers of motorbikes and scooters. It is still a really fascinating country to visit. What a wonderful post, Linda. Gorgeous pictures. The fountain with the rose petals is exquisite. 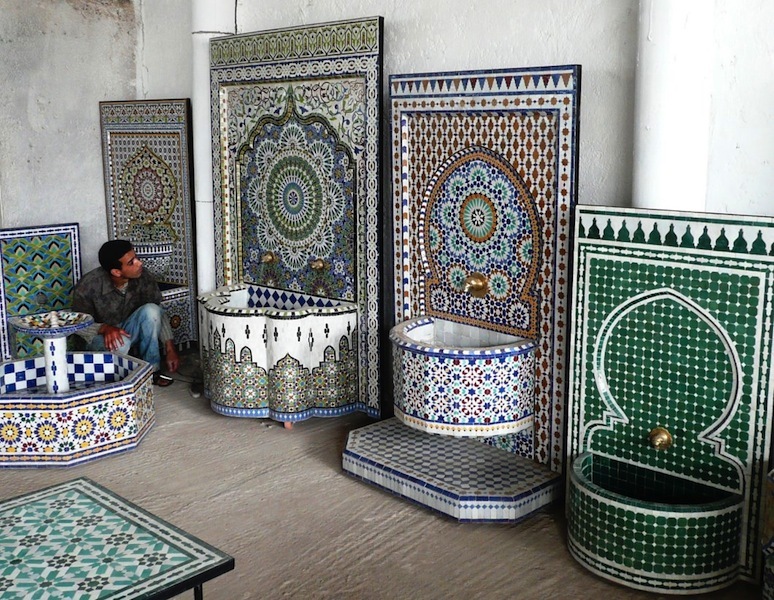 Love all those courtyard mosaics and tiles…so cooling and restful. I can hear the water trickling through your words. Very evocative. The Volubulis floral color gorgeous. And that tree with the goats!! !